The Waterworks building at Richmond and Augusta is one of those historical properties that might not have fared so well if it was proposed for redevelopment a generation ago in Toronto. Today, on the other hand, the city's track record on adaptive redevelopment and mixed use buildings is far stronger than it once was. Case in point, plans have finally come together to redevelop the former industrial building, and while condos will be a part of it, the project is one of the most diverse we've seen. In addition to the YMCA that area Councillor Joe Cressy has pushed for at the site, there will also be ground-level retail, a sprawling public hall, rooftop garden, and space reserved for Eva's Initiatives for Homeless Youth. Of the residential component, Artscape will control 15 suites for low-income housing alongside the rest of the condo units, which are being developed by MOD Developments and Woodcliffe Landmark Properties. The condos will rise 11 storeys above the existing heritage building, the exterior of which will be maintained in addition to the great hall. Diamond Schmitt Architects will handle the design of the new structure, while Cecconi Simone is responsible for the interior space. Interestingly, each of the 299 residential units in the building will be unique, another departure from standard condo design in this city. The term mixed use tends to get thrown around in Toronto a bit too easily, but this is a solid example of how to build in the city's densest areas. The addition of the YMCA is already a major boon to the area, but the other elements also ensure that the development will have a lively public element that so few condos possess in Toronto. St. Andrew's Playground will also be expanded 25 per cent as part of the redevelopment plans. The great hall will open onto this outdoor space, engaging the building with the community. That the whole project comes with a strong heritage component is more than just a bonus; it's a reminder that sites like these teem with potential if you can get the right players to reimagine them. 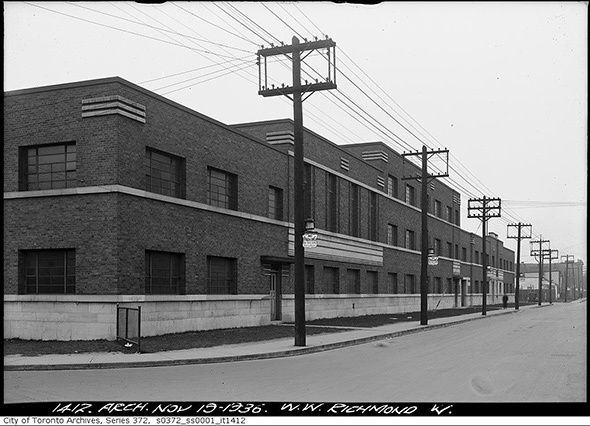 The Waterworks isn't the most stunning historical site in Toronto, but its Art Deco-styled architecture is worth preserving, and will likely be better appreciated when the building is reanimated.